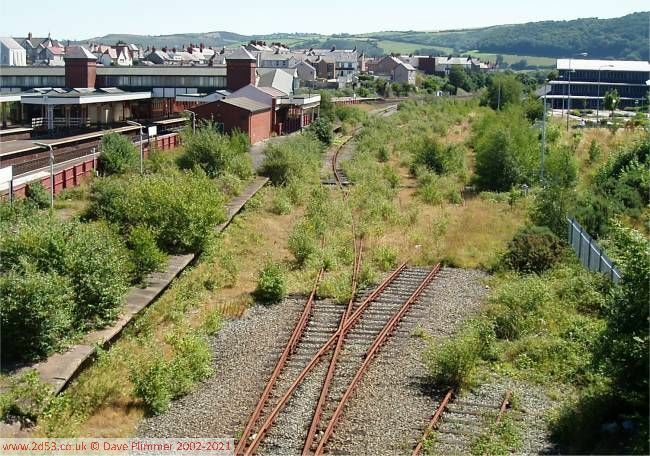 A visit to Llandudno Junction in July 2006, and seeing the sad state of the sidings alongside the station, prompted this page. Llandudno Junction sidings, as seen from the road bridge that now crosses the station, on Saturday 15th July 2006. The sidings appear to be intact but completely out of use, and pretty close to unusable. In more productive times, 24035 shunts the sidings in September 1977. 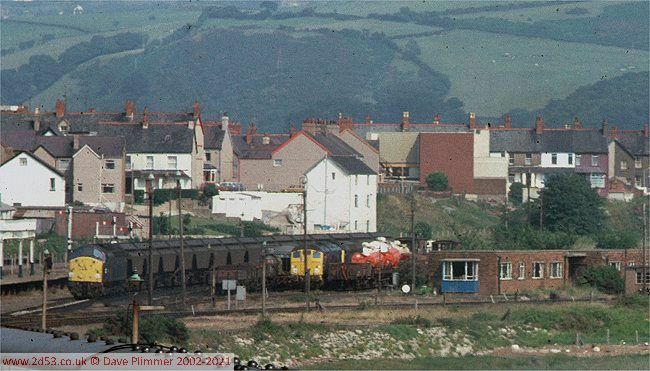 Present as well as the 24 and its brake-van are an international ferry wagon, and to the left the afternoon freight to Mold Jcn with a Class 25 on the front. A year later, the same loco is present again, and the sidings are much busier. From left to right the sidings contain: mixed coaching and freight stock, a Class 47 'light engine', a Class 25 with the caravan transporters and brake van, the empty run round road, and 24035 on the afternoon freight to Mold Jcn. In connection with the A55 works, these sidings were not considered sufficient and another loop was added, much longer then the others, to the right. This was used for run round and examination of the flyash workings. Even later, around 1988, a seventh siding was added. All these sidings are still present. 8th September 1978. 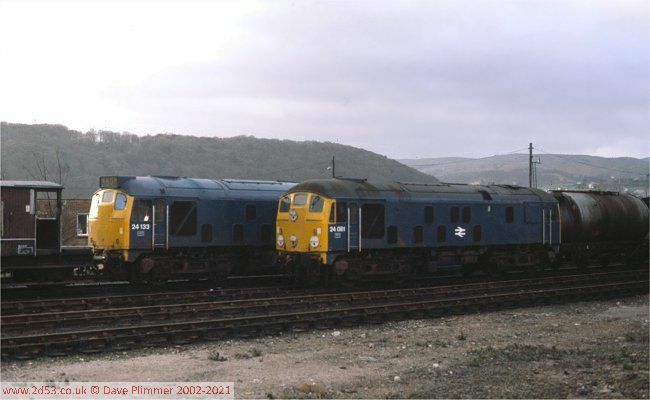 Following the new-year holiday weekend, on 3rd January 1978, 24082 was rostered to work the Amlwch Trip Freight. On arrival back at Llandudno Junction with the morning working from Amlwch, an extra turn to Mold Junction was added. Here 24082 is seen reversing out of the sidings onto the mainline to reverse and head eastwards. None of this wide-open aspect is now visible, but the platform lighting seen on the right remains, although with the heads turned around, and these lamps can be seen in the picture at the top of the page. 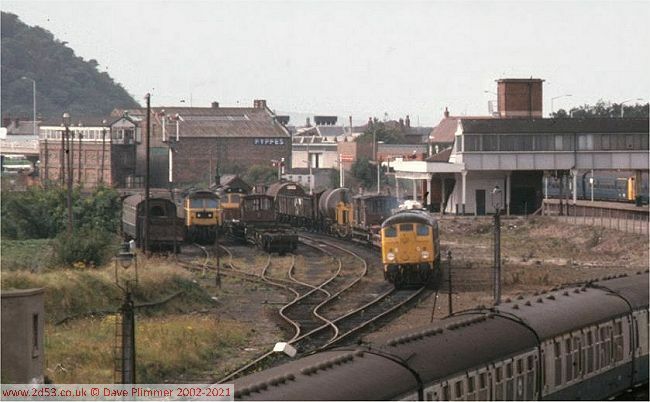 On this day, three of the trip workings from Llandudno Jn were worked by class 24s. Here we see two of these workings in the sidings - 24133 after arrival with just a brake van on 8T47 from Blaenau Ffestiniog, and 24081 with just an oil tank and brake van on 8T30 from Holyhead. 3rd January 1978. 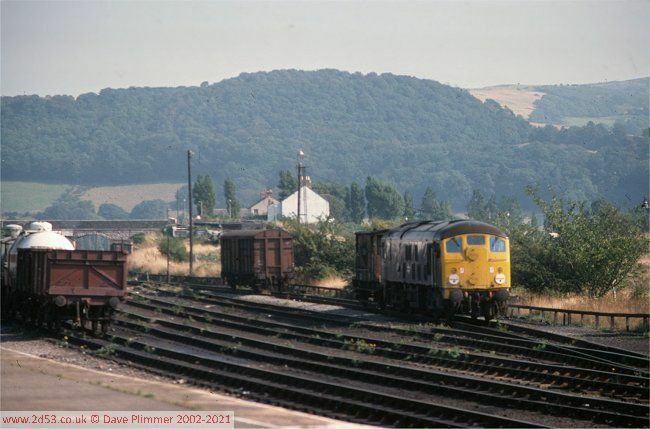 In a long zoom picture from the road flyover, 40118, 24035 and 25304 are seen in the sidings on 12th July 1978. 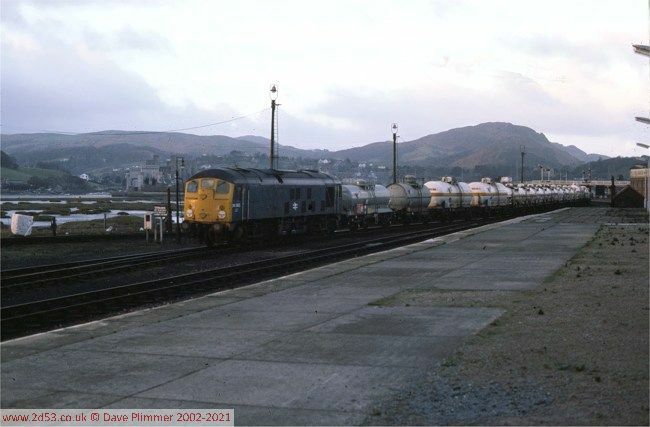 40118 heads a rake of petroleum coke hoppers en-route to Anglesey Aluminium at Holyhead. All images on this site are copyright Dave Plimmer � 2002-2018 and may not be reproduced in any form without prior consent.